Well, the short answer is 2037, plus or minus a few years. That’s not a flippant answer, either. All forms of digital preservation really will stop around 2037, unless some kind of energy supply breakthrough happens. How do we arrive at this date? Let’s go thorough this step by step. The fundamental premise behind what follows is that digital preservation cannot survive the collapse of our technological civilisation. If you disagree with that premise, that’s fine, but you might as well stop reading now. It is always good to be clear about our premises before we begin. If you agree with the premise, then let’s carry on. Digital media have much shorter timespans. It is doubtful that a hard drive will be able to spin and deliver its data a few centuries after our society has collapsed. Technologically-dependent data storage therefore cannot survive massive societal collapse in the same way that non-dependent data can. A1: Digital preservation will come to an end when technological civilisation comes to an end. Now let’s start to pin this down. When will technological civilisation come to an end? Modern computing is wholly dependent upon hardware which in turn is wholly dependent upon fossil fuels for its creation and maintenance. The servers or CDs which preserve our data incorporate plastics which have been refined from crude oil supplied by OPEC. The dust-free clean rooms in which the chips are made are kept clean by energy derived from burning hydrocarbons. The finished computers are distributed globally by diesel-burning ships, which deliver them to ports from which the machines are then placed onto diesel-fuelled trucks for final distribution to warehouses and shops. The world’s ICT infrastructure is maintained by people who get to and from work in vehicles powered by petrol. Without crude oil none of this would happen. The oil basis of modern ICT is an issue which gets raised from time to time. In December 2007 New Scientist reported that “computer servers are at least as great a threat to the climate as SUVs or the global aviation industry,” due to their carbon footprint. A 2004 United Nations study showed that the construction of an average 24-kilogram computer and 27-centimetre monitor requires at least 240 kilograms of fossil fuel, 22 kilograms of chemicals and 1,500 kilograms of water – or 1.8 tons in total, the equivalent of a sports utility vehicle. Take away all this oil, plastic, petrol and diesel, and the world’s ICT structure becomes unsustainable. Motherboards become trickier to manufacture if you only have wood and brass. Gathering together the components and then distributing the finished machines becomes harder if you are dependent on sailing ships, horse-drawn carriages and barges for transport. A2: Digital preservation will end when the oil supply comes to an end. But when will the oil supply come to an end? Never, in a sense, because at some point it will become too uneconomical for the world to drill out the last remaining drops. There will always be some oil left in the earth. Sadly that’s no help to us, because we will be back in the stone age by then. A better question is, when will the oil supply start to run out? – because that’s the point at which civilisation crashes; that’s the point at which any particular country can only increase its own oil and plastic by taking away oil and plastic from another country. And from that date, year on year, there will be less oil and plastic than the year before. I’m no geologist, so let’s go to the experts on this one. The EIA (Energy Information Administration) is the energy data arm of the US government. In 2004 the EIA published a report on Long Term Oil Prospects, which looked at exactly this question. The report’s authors considered a number of likely scenarios for both (a) the total amount of oil in the ground and (b) the increase in demand for oil as time progresses. Then they mapped out all these scenarios. 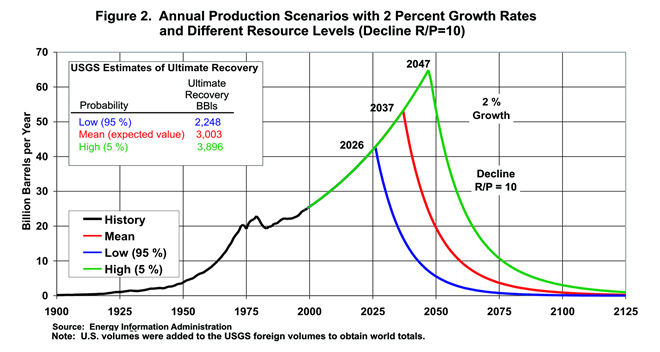 This graph shows the three main scenarios, with the central one being the likeliest, as it is based on a world total oil production figure of about 3 trillion barrels of oil, which is the US Geological Survey’s assessment. The overall curve has a sharkfin shape. World oil supply rises upwards with a 2% annual growth rate until it peaks and then suddenly falls, when the world’s oil wells cannot meet demand. The peak comes in 2037. A3: Digital preservation will come to an end in 2037. That doesn’t sound very optimistic. No, but the oil might not run out in 2037. It might run out later (although the crash will be bigger). Some people, such as the Peak Oil crowd who hang around at The Oil Drum, think the oil supply might be running out just about now, but I’m no energy expert so I’ll stick with the US government’s EIA on this one. The longer we have, the better are our prospects at longer term digital archiving, because it gives the world more time to create and roll out a new ICT structure, one which doesn’t use oil-derived plastics, or depend on oil for distribution, power and maintenance. On the other hand, the shorter we have, the worse our prospects will be. Excellent, dystopian post. I’ve recently enjoyed provoking arguments with my friends when I point out that we’re likely to starve and huddle in the dark in the name of keeping Google alive. It’s frighteningly easy to imagine. Unfortunately, we still live in an era where your paean to paper falls on deaf ears. It’s nearly impossible to convince anyone that printing a ream of paper records is less expensive in the end than building a digital repository. I hadn’t even thought to include energy costs. … and there’s me at first thinking you are onto the Unix date problem! But that’s 2038 rather than 2037. I’m not a bleeding optimist, but I _do_ have a copy of “Limits to growth”, the Club of Rome report from the 1960s that predicted, based on the best evidence available, that oil would run out, oh I don’t remember, but years ago. So best evidence can be wrong. And you haven’t quite factored in the effects of prices. OTOH the basic principle that exponentially increasing growth cannot be met for ever from finite resources, is strong. A real question: can we invent a digital preservation methodology that does not rely on regular, frequent inputs of energy? Xerox people used to talk about compact barcodes on paper, but I’m not confident of that. I want something with a self-booting intro so our far descendants can learn how to invoke it. Maybe it _is_ just text? Hi Chris, I’m aware of the old Limits to Growth forecast, but it is a bit of a red herring you have raised, because I did not mention the Limits to Growth in my original post! There’s a wealth of oil production predictions out there, so I deliberately went for the one which seemed to have the greatest official backing. Best evidence can turn out to be wrong, but best evidence still remains our best evidence. We need to base our forecasts on something, and if we don’t base them on current best evidence then I’m not sure what else we can base them on. Back to digital preservation. Your question “can we invent a digital preservation methodology that does not rely on regular, frequent inputs of energy?” is an excellent one, because it sums up a major issue with digital preservation. Paper is a great preservation medium (for born-paper records) because it places the minimum workload on future generations. Digital records however need life support machines, which in turn need humans continually tending them, which places the maximum workload on future generations. When the oil supply fails, the life support machines for digital records will stop. If the US government is right then we have 29 years to think up a way to replace these life support machines before they get turned off permanently. Next year we will have only 28 years to sort it out. At the moment I’m a bit stumped as to what the solution could be… Most people seem to regard 29 years as too long to worry about, but I’m an archivist in a local authority archives office, with parhcment documents going back to the 12th century, so 29 years seems horribly short. Sorry this has been such a lengthy reply. I’m also optimistic about peak oil to the point of sounding Pollyanna-ish: I hope peak oil gets here sooner rather than later, so that the market itself will (could) price in the need to switch to alternative sources of energy. That’s assuming we don’t see any stupid subsidies for fuel caused by complaints from the general public. Still, there will come a time (and I don’t think peak oil will be it) where our allegedly mighty civilizations will falter, and the digital infrastructure will crumble. And what then? We have a few alternatives, in preparing for that day. We can strive for a technology that can take care of itself entirely, or we can strive for a technology that could be maintained successfully by the future equivalent of monks in monasteries. That’s how many of the greatest works from antiquity survived until today: transcription by hand – over and over again. If that’s not a burden on future generations I don’t know what is. But we need open source technologies to make it even remotely possible to support that kind of dream. And I think (and hope) that people like yourself will be able to take a part in safeguarding our future and our repositories of knowledge. (BTW – did you know that all of the English language entries of Wikipedia can be downloaded in a single file of less than 5 GB? I was amazed – and pleased). Cheers Mike for the Pergamum TOMES link, I’ll check that out. The way I see current digital preservation is that it’s wholly dependent on technological civilisation staying around. If we’re really serious about long term digi pres (which we should be) then someone needs to work out a way of preserving electronic information which isn’t reliant on a massively complex, oil-based physical infrastruture. A medieval monastery makes an interesting analogy because a monastery is independent of a large infrastructure. A monastery just needs a few fields to grow food, keep chickens etc and a supply of animal skin to write things on. But if monasteries had been dependent on a wider national or international infrastructure for day-to-day survival, then it’s doubtful they would have survived. Which suggests that post-civilisation digi pres is possible, but only if we can work out a way to create self-sufficient local technological systems which can carry on going indefinitely, using purely local resources and materials, even if the rest of society falls to pieces arounf them. I also knew about that i am from Afghanistan i have also predicted that after 2030 the humans will not be normal ones like they are now they will be changed into beasts not the real beasts but their nature will be like beasts and you will see first of all the destruction of USA and Europe and the human beings would once again go back 1000 years in time like 11th century…. but the Lord has said something else in the holy quran but this technology is going to her end very soon.